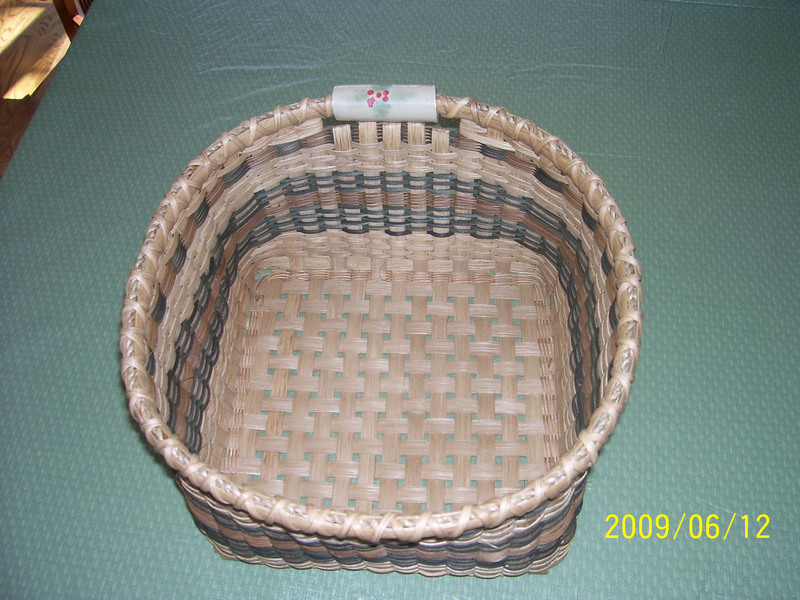 This rectangular basket has a filled base making it very sturdy. The accent in the middle of the basket is 3 rod wale. Wrapped handles that work in with the rim finish the basket. (If you have pottery handles, you may want to bring them and see if they will work. This basket is a great addition to any party, buffet or family dinner table. It can be used with or without the heavy, divided insert. It begins on a special wooden, slotted base and includes an accent arrow weave in the color of your choice. The challenge is to be sure the insert fits when the basket is completed. It's a fun basket to have in your entertaining arsenal. A large tote has many uses! I take mine routinely to the local Farmers Market. 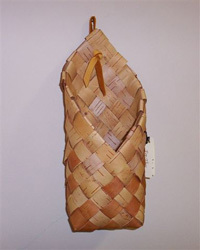 The design comes from color placement of the stakes and weavers, and the leather handles are comfortable to carry. We will add runners on the bottom for extra strength. Some color choice will be offered. This class was cancelled for health reasons - Diane was in the hospital after surgery. 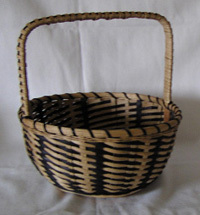 Basket is woven in a Scandinavian double diagonal design using birchbark strips. We will learn how to prepare the bark for weaving. Can be used for eyeglasses, pencils, or decorative. 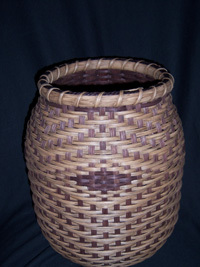 Coiling is one of the most versatile basketry technique. You will use fiber rush as a core, and the stitching fiber is waxed linen. Discussion will include the flexibility of shaping, using a secondary color, considering a variety of other materials for the core and stitching, and how to finish your piece. Students are encouraged to create their own original design. Image is a sample, not an example. Bring a pair of small sharp scissors, and a notebook for notes. Note regarding this picture: this is a sample, not an example, meaning each student will focus on their own design and will not be making the same exact item. Bring a pair of small sharp scissors, and a notebook for notes. This double-walled, quatrefoil twill basket is on a wood base and has a dark brown inner basket. The outer basket is woven in a quatrefoil twill. I designed it because I’ve always had trouble shaping a quatrefoil and this solves that problem – all the shaping is done on the inner basket. When you get to the twill, you can concentrate solely on that. I will also have the option of doing a less complex twill if someone wants it. Students will make this great colorful storage basket starting with an oval base. All the spokes are 3 different colors along with the same colors as weavers woven into the top. End with a totally unique rim of leather! Embellishments are extra or bring your own. 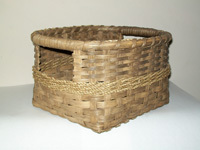 Learn double wall construction and cathead shaping in this very sturdy basket with hand carved oak bushel basket handles. The compensation on the outside wall will make the design for the overlay embellishment. 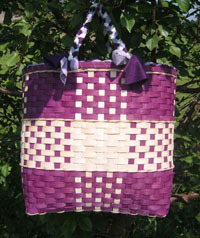 Basket is woven in space dyed and natural reed. 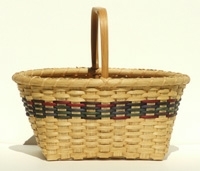 A very useful basket from the home to the garden. A great size market basket. 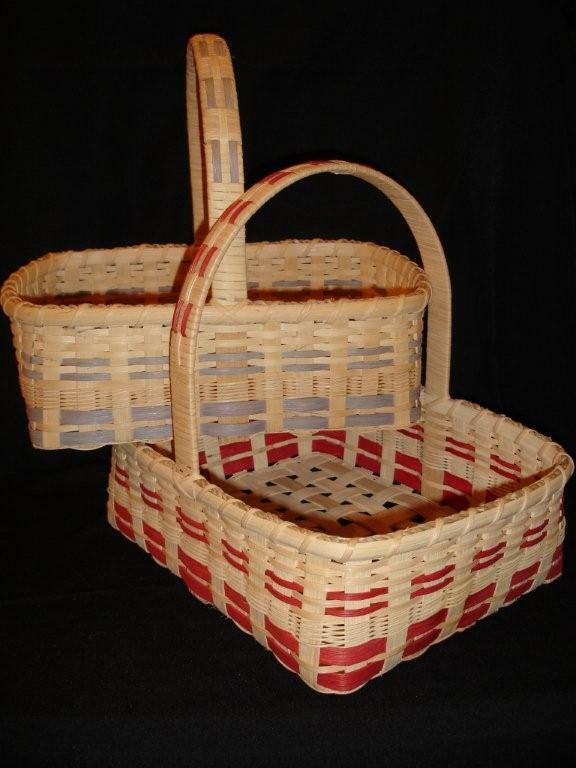 Learn Bob’s methods of refined finishing techniques to take your basket to the next level of basket weaving. Use space dyed reed for the color band. 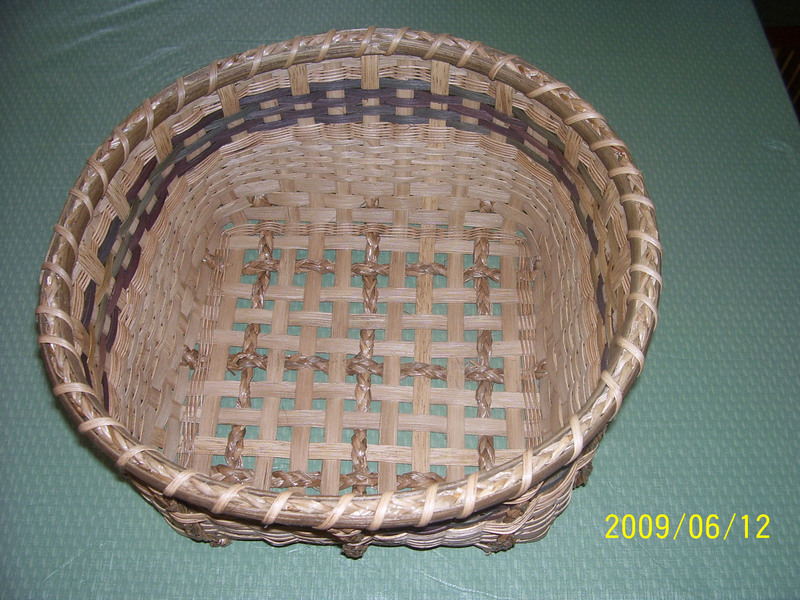 This basket is topped with a hand carved oak square handle. A 12” D handle forms the structure of this full bottomed classic plaited basket. 5/8” reed is used for spokes and weavers. 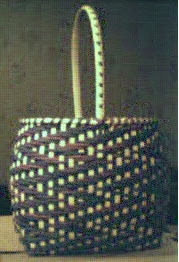 Basket features an easy BRAIDED handle; using cane for braid. Cane is also used for rim lashing. 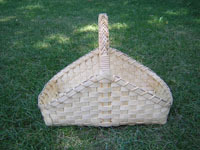 Instructor will have smoked or natural reed to use for basket. The instructor would welcome others at Guild classes that would like to learn (EASY) BRAIDED HANDLE technique, cost would be $5.00. Bring (1) your own handle, (2) one piece of flat reed (1/4" or 3/8") that measures 3" longer than handle area to hold braid in place, (3) three pieces of flat reed (1/4" or 3/8") to use for braid, they should measure 3x the length of braid area, and (4) one piece of flat reed (1/4" or 3/8") that measures 4 times the length of basket handle area for LASHING. The instructor will have some handles, cane and flat reed available for purchase. This large quilt basket has a delightful color design worked in. It can hold a large quilt or several lap quilts, but is not too large to carry from place to place. It has a solid bottom and easy-to-make handles. Naomi's Quilted Basket is so fun to weave and see the patterns develop. Students will have a choice of color if specified when they register for the class. Color choices are: Purple (as pictured), mint green, navy blue, dusty rose, walnut, yellow and burgundy. Handles will be matched to the reed choice, and the rim filler is matching fabric. This is my daughter's pattern, Naomi Risatti. 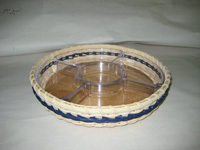 The base of this basket is reinforced with a second length of spoke to add stability to this basket. 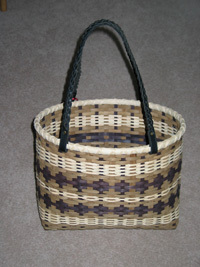 The 12” x 14” D handle is wrapped with ¼” f/f in a pattern to simulate the pattern that found on the body of the basket. The pattern is established by weaving in dyed weavers and multiple rows of twining with #2 round reed. This is my own creation. 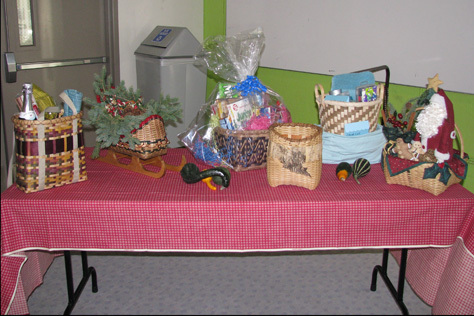 The 11th annual Basket Bingo Fundraiser. Play bingo and win baskets! Come and enjoy fun door prizes, food and a raffle. Bring your friends and family, this event is always a lot of fun! Don't miss it! 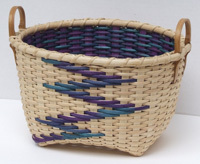 This striking zigzag twill basket works great next to your favorite chair as a craft basket, or for magazines – or just put in on a shelf, and let people admire it!